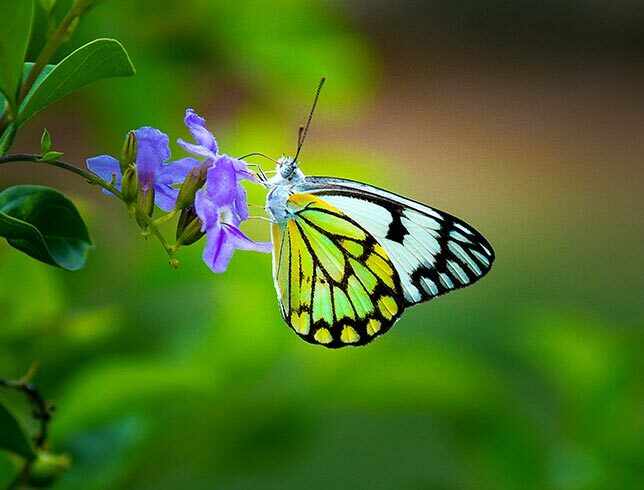 Situated at the southernmost end of Duval Street, the Key West Butterfly & Nature Conservatory is home to more than 50 species of butterflies and 20 species of exotic birds. Stroll through lush tropical landscapes filled with plants, flowers, and cascading waterfalls before making your way into the climate-controlled and glass-enclosed habitat where hundreds of delicate butterflies flutter alongside colorful birds, fish, and turtles. Visit the learning center and watch videos about the metamorphosis phase from a caterpillar to a butterfly, listen to the breading process of butterflies, and learn other interesting facts. Voted Trip Advisor's #1 family attraction in Key West, the conservatory also features a unique gift shop for all things butterflies, as well as an art gallery showcasing the works of Sam Trophia. The Conservatory is open daily from 9 am to 5 pm. The Gallery and Gift Shop are open daily from 9 am to 5:30 pm. What birds can I see at the Key West Butterfly and Nature Conservatory? Expect to see over 20 species of birds while touring Key West Butterfly and Nature Conservatory. Among them are the famous flamingoes that greet you at the entrance and follow you around your tour. Others include hummingbirds, nightingales, and quail, along with many others intermingling with the butterflies in glass-enclosed exhibits. Is there parking at the Key West Butterfly Conservatory? Yes, just behind the conservatory via the brick driveway from Duval Street, there is a small parking lot with a limited amount of free parking spots available during regular business hours from 9 am to 5:30 pm. The lot is first come, first serve and does fill up fast. There is also street parking available or nearby pay lots.